is it a boy in a costume, or is it a sick angler luring in children unawares? who knows? well, there is one person that can tell you, and that person is me... but i won't tell you, no, i won't. this guy is just a barrel of laughs. his sinewy limbs may be the last thing you ever see as you laugh at the irony of life. Pronounced "jum jum," is from the water planet Budgitkis. 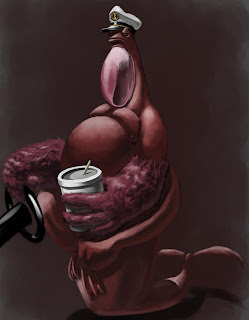 Dium Dium developed a taste for Soda on Earth while posing as the Lochness Monster after losing a bet to his friends. So addicted was he to the soda, that he ripped off his flipper arms and attached these hideous furry ones in order to captain a school ship that regularly visits Earth. The Ships abducts humans in order to teach anatomy and physiology... conveniantly, the Human usually works for a major soda company. I still need to figure some stuff out painting wise, but figured i would post it anyway.